In terms of titles won, Karpaty cannot be compared to Ukraine's two true powerhouses, Dynamo Kyiv and Shakhtar Donetsk, but the “Green Lions” from Lviv can still pride themselves of being the biggest, the most successful, and the most popular club in Western Ukraine. As for their pre-independence achievements, they hold the unofficial title of the only team to have won the Soviet Cup while playing in the country's second division. Looking at the founding years of Ukraine's biggest clubs, FC Karpaty Lviv are the youngest of them all, being formed in 1963. Interestingly, they were the ones who won a major trophy faster than any other Ukrainian team, lifting the prestigious Soviet Cup only six years later, in 1969, eliminating some of that era's biggest names, and beating the Army team from Rostov-on-Don in the final. What makes their achievement not just historic, but literally unique, is the fact that Karpaty won the title while at the same time competing in Soviet Union's “First League”, which, despite its name, was actually the country's second division. Next year, still playing in the “First League”, they made their first international appearance, getting eliminated in the first round of the Cup Winners' Cup, despite a spectacular 3-3 draw in the second leg in Bucharest against Steaua. The Romanians had won 0-1 in the first game, and that away goal gave them the ticket to the next round. Soon, Karpaty finally made it to the Soviet Top League, where they spent most of the seventies, having two great back-to-back seasons in 1975 and 1976, finishing 6th and 4th respectively. Spectators-wise, the seventies produced some numbers that have yet to be met (let alone surpassed), as there were seasons that Karpaty averaged more than 30,000 fans per game at their Ukraina Stadium, then called Druzhba (“Friendship”) Stadium. The eighties were rather dark times for the club, playing in lower categories, merging with another Lviv team, SKA, being renamed SKA Karpaty, and changing their main colour from green to red (SKA's dominant colour). Ukraine's independence in the early nineties, found Karpaty jumping from Soviet Union's third division, to the new country's top division. A sixth place in the Championship and a lost Cup Final against Dynamo Kyiv, were followed by an even better finish, 5th, in next year's Championship, and another good run in the Cup, up to the semifinals. Despite their promising start in independent Ukraine's national competitions, Karpaty has yet to finish higher than third in the Premier League, or win a Cup (in 1999 they lost another Final, again to Dynamo Kyiv). 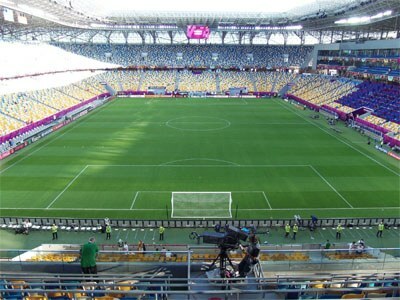 Even so, their passionate fanbase, their status as Western Ukraine's biggest team, even the fact that they now call Arena Lviv home, easily the country's most modern and beautiful football-specific stadium (as long as Donetsk's Donbass Arena remains off-limits), earn them a spot in Ukraine's football elite. Outside Arena Lviv in 2016. Karpaty are named after the nearby Carpathian Mountains, which actually used to appear on their logo. Today's emblem has been in use since the nineties, and its dominant figure is a lion, the main symbol of the city itself. Green has always been Karpaty's main color, excluding the eighties, when they switched to red, having merged with another Lviv team.